Los Angeles International Airport (LAX) is about to get a lot bigger. According to a recently-closed Request for Proposals (RFP), the city of Los Angeles is preparing to build its largest new terminal at the airport in over 20 years. Several major firms have applied for the project, one of the first steps in the airport’s ambitious redevelopment plans. 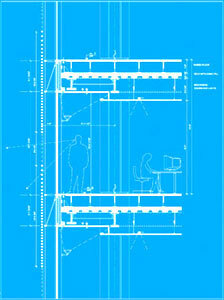 An architect should be chosen within one to two months, according to LAX officials. The new “Midfield Satellite Concourse,” located about a quarter mile west of the airport’s Tom Bradley International Terminal and at the location of a current hangar area, would measure 500,000 to 600,000 square feet. Cost estimates have not been released. According to an RFP issued last fall and closed to entrants on December 20, the new terminal would stand about 140 feet wide, 700 to 1,000 feet long, and three to four levels high. 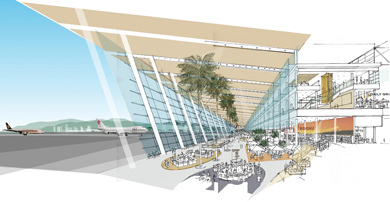 The new terminal would be able to accommodate eight to nine Airbus A-380 aircraft gates, and would be connected to Tom Bradley via a 1,400-foot-long underground pedestrian tunnel. 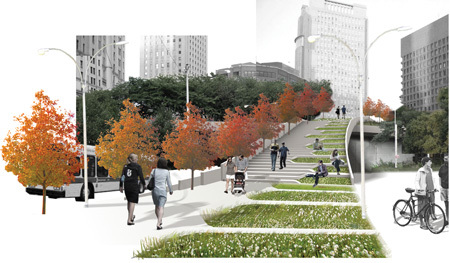 That tunnel would either include moving walkways, a people mover system, or both. The plans also call for a 100,000-square-foot, 80-foot-wide and 540-foot-long expansion of the Tom Bradley terminal, allowing for new gates along its west side. 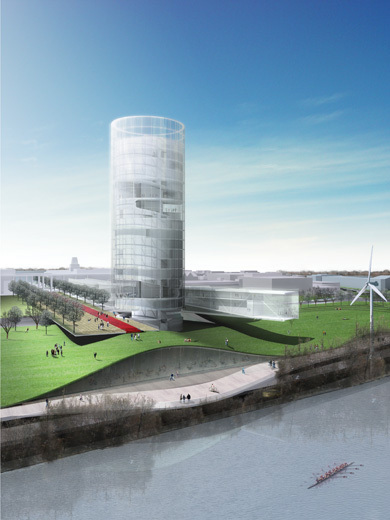 The RFP also says the building would aim for a LEED Silver rating. LAX officials have not disclosed which architecture firms applied for the project, but according to one applicant, the competition includes Santiago Calatrava with Gensler Architects; Foster and Partners with Leo Daly Architects and the Smith Group; Fentress Architects with HNTB; and Johnson Fain with HKS. DMJM Aviation was awarded $25 million on March 3 to be the project’s contractor. The airport’s last major expansion came in 1984, with the opening of the Bradley terminal and domestic Terminal 1. 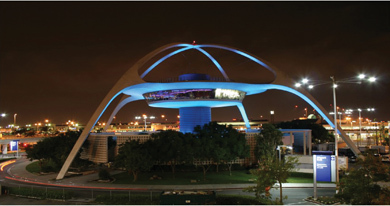 The current expansion is a major step for the LAX Master Plan, released in 2005. The massive $5 to 8 billion plan also calls for new gates, taxiways, parking structures, a new ground transportation center, an intermodal transportation center to connect to public transit, and even a new Central Terminal Area that will replace the airport’s existing parking structures. Last February, work began on the $723.5 million modernization of the Tom Bradley Terminal, led by Leo Daly Architects. 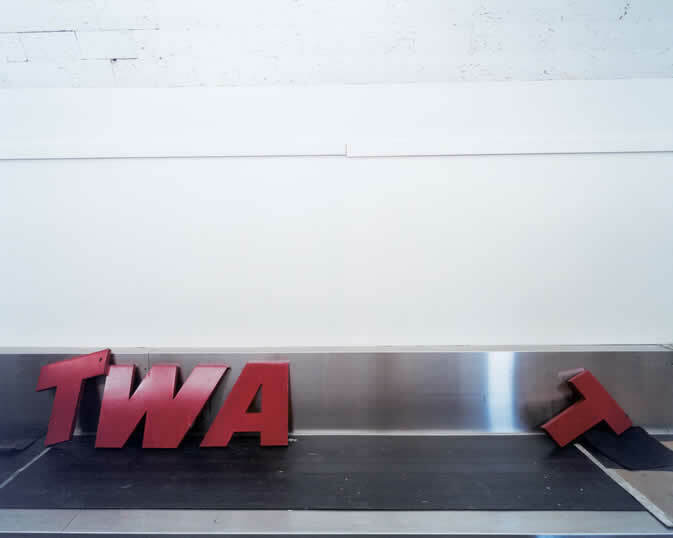 That project, which the airport calls the largest individual project in city history, includes interior renovations (including an updated look and new furniture, lounges, and amenities), new LEED certified building systems, installation of an in-line checked-baggage security system, and a second boarding gate for extra-large planes. Work should complete by March 2010. Meanwhile, this February the city approved the building permit for restoration of the airport’s iconic white-arched Theme Building. The 1961 building designed by Paul R. Williams had deteriorated significantly. The work, led by LA-based Gin Wong Associates, will include reinforcing the structure’s core, adding new lateral bracing for its upper arches, repainting its exterior, replacing its plaster cladding, and seismic upgrades. That project is scheduled to be done in May 2009. No matter where you were in Los Angeles on the night of October 18, it was difficult to miss the opening of the Nokia Theatre. Not only did the building glow brighter than every other building in downtown, but dozens of lights spun deliriously into the sky, putting any klieg-lit premiere in Hollywood to shame. The sleek building is the first completed building at L.A. Live, the massive residential and entertainment corridor taking shape in the blocks adjacent to the Staples Center, in the South Park neighborhood. When completed in 2010, the 4-million-square-foot L.A. Live will also include the 2,400-seat Club Nokia venue, corporate office space for Herbalife, studios for ESPN, a Grammy museum, and a flurry of dining and entertainment tenants. A 54-story tower designed by Gensler will serve as the anchor hotel for the convention center, including residential units, a 123-room Ritz-Carlton and an 878-room J. W. Marriott. AEG, the sports and entertainment corporation that also owns Staples Center, is serving as developer for the project, which is estimated at $2.5 billion. 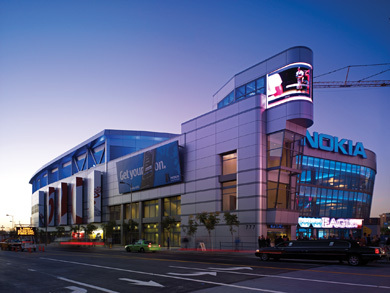 Berkeley-based ELS Architecture designed the 260,000-square-foot, 7,100-seat Nokia Theatre. The 40,000-square-foot plaza surrounding the theater was designed by Rios Clementi Hale Studio of Los Angeles. More important to the exterior are the throbbing LED panels that plaster the building, giving it that healthy glow. These had to be distinctive from the air, as the Nokia-Staples complex will serve as the centerpiece of the “blimp shot” for broadcasting events. 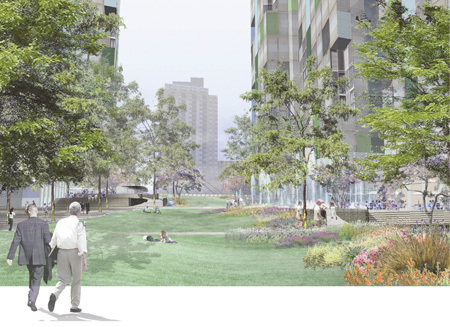 A similar consideration had to be made for the plaza, where an elegant graphic paving pattern lends richness for television cameras and familiarity on a human scale, said Bob Hale, partner at Rios Clementi Hale, alluding to more than 15 residential towers completed or under construction within walking distance of the plaza. “For certain events it will be the center of LA, but on a day-to-day basis it’s the town square for that part of South Park,” remarked Hale, who also said that developers would like to bring a greenmarket to the plaza as just one of its many uses, from red carpet arrivals to cultural festivals. For special events, the plaza itself can convert into an entertainment venue, aided by an electronic infrastructure that allows “plug and play” audio visual capabilities, and the six towers, which can further support filming, projection, or performance space. The plaza is flanked by landscaping, including planters that provide places to sit and gather while shaded by canopies of plane trees. Rios Clementi Hale’s design will continue to be implemented to visually unite the entire L.A. Live complex. Zoning required a setback roughly in line with the building's third box. A tight budget prevented a full build out to that line, creating the opportunity for SANAA's playful composition. ome renderings, like some photographs, become fixed in the brain. Architects equipped with ever more sophisticated techniques for producing ever more seductive—and seemingly real—images must contend with the expectations their renderings produce. Some visitors may grouse that the built reality of SANAA’s New Museum of Contemporary Art does not correspond exactly with the shimmering rendering that the late Times critic Herbert Muschamp breathlessly called “little SoHo lofts that died and went to heaven,” but so much the better. The building’s unexpected toughness is appropriate for its location on the Bowery, where a still-active flophouse sits next door and restaurant supply wholesalers line the block across the street, and for its client, known for showing experimental work and for eschewing the preciousness of more established institutions. Which is not to say that the building doesn’t shimmer, sometimes. When sunlight or nighttime illumination strike the aluminum mesh cladding just right, it glints and sparkles. More often, however, the building appears somewhat muted except at the transparent street level, which, with its delicate electronic signage, visible rear gallery, retail space, café, and exposed loading area, promises to be full of activity. This tension between stillness and animation—emphasized so much further by the arrangement of the building’s offset box-like floor-plates, perfectly balanced between the deliberate and the haphazard—creates a fascinating, somewhat off-axis terminus to Prince Street. Initially the architects had planned to clad the building in galvanized or stainless steel panels, but testing found that New York’s lead-filled air would have quickly left the surface pitted and dirty, exposing its seams. Eventually, they settled on the mesh, an industrial material manufactured in England that was originally used to stabilize roadbeds. The sheets of mesh overlap, creating an almost seamless look from the street. Suspended by simple aluminum clips, the mesh covers a system of extruded aluminum panels. “We wanted it to read as a single surface,” said Florian Idenburg, one of the two people from SANAA’s office who relocated to New York to run the project. Gensler is the executive architect on the job, acting, said Idenburg, “like the big brother firm, showing us how things work,” he said. Using ordinary materials, albeit carefully detailed, is something of a departure for SANAA, whose aesthetic identity has been defined by ultra-refined surfaces: nearly invisible glass walls, such as in the Tokyo Dior headquarters or the Glass Pavilion in Toledo, Ohio, or razor-thin steel partitions, as in the House in a Plum Grove, also in Tokyo. Idenburg admits that the firm’s comfort with commonplace materials called for a learning curve, but thinks it is better suited to their client. “They asked us to design a black box theater and we asked if we could make it white instead, and they said sure, we’ll just paint it black if we don’t like it,” he said with a laugh. 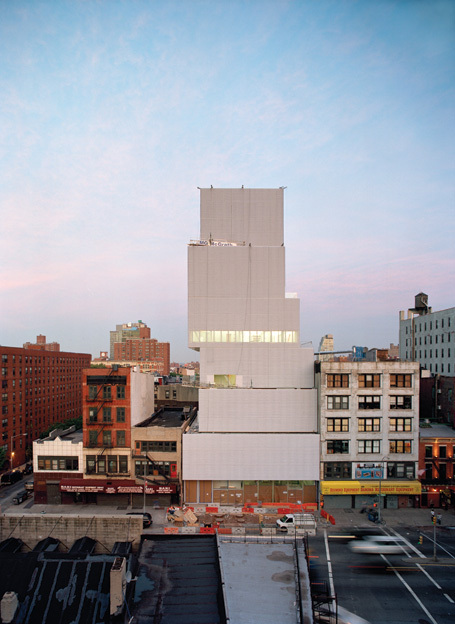 The architects may be prominent, but at the New Museum there are few sacred cows. “Sejima calls it beautiful rough,” said Toshihiro Oki, the other member of SANAA’s office in New York, of principal architect Kazuyo Sejima. If the materials are simple, the sequence of spaces is rich. “When you are designing galleries for contemporary art, you are basically designing spaces for art that doesn’t exist yet,” said Idenburg. SANAA responded by creating three distinctly different galleries with varying levels of natural light. All three are restrained white boxes lit by grids of fluorescent tubes: unpretentious, blank canvases for artists and curators. The fourth floor gallery feels vast with 24-foot ceiling heights. An unadorned staircase edges outside the elevator core, offering a glimpse outside through a side window. This outside stair is also the only point of access for a small art alcove, carved out of the building core, which also serves as an air return. The third floor is more moderately scaled at 21 feet high, while the second, accessed by elevator or through an internal stair in the core, is the lowest, at 18 feet, but has the largest floor-plate. Above the galleries, an event space offers sweeping views of downtown, including from a somewhat vertiginous glass railed terrace. 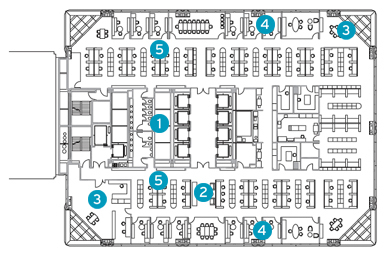 Educational spaces and offices are located on the fifth and sixth foors. The top box holds mechanicals and is open to the sky. SANAA’s work has often been referred to as evanescent, and their early conception of the building may have fit that description, but they have delivered a much firmer and well-defined work of architecture. 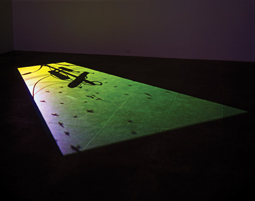 By initially offering an image that could bewitch the imagination of the public—and perhaps more importantly, the imagination of the press—and then moving away from it to serve the needs of their client, SANAA has satisfied the contemporary lust for spectacle while creating a museum building that is all about the art. In early September, a competition-winning plan by UK-based Foster + Partners and design and engineering company URS was cleared for lift-off, as details were finalized on the hangar and terminal facilities for Spaceport America, the first purpose-built commercial spaceport in the world. The 100,000-square-foot complex located in Las Cruces, New Mexico, is expected to be fully operational by 2010, with two or three suborbital flights daily, five days a week. The $31 million hangar by Foster is a small portion of the $200 million spaceport complex, funded by New Mexico and a 0.25 cent gross receipt tax adopted by local counties. 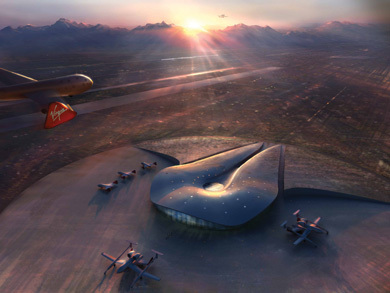 Richard Branson’s Virgin Galactic will serve as the spaceport’s anchor tenant, occupying training facilities, pre- and post-flight lounges and two maintenance hangars. 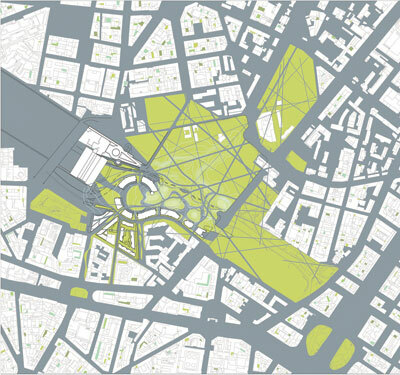 The competition included two other finalists: Dallas-based HKS working with Antoine Predock of Albuquerque, New Mexico, and a San Francisco-based Gensler team in association with Rohde May Keller McNamara Architecture, also of Albuquerque. The hangar is bermed into the earth. A major requirement of the design was that it could not disturb the uses or views of nearby El Camino Real, a historic trade route that traverses the valley. 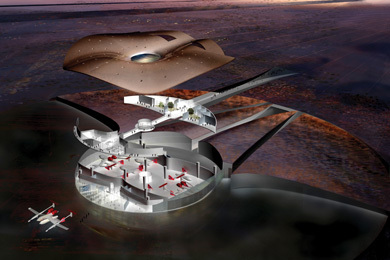 Completely concealed from the west, the spaceport will be bermed in earth materials sculpted into low-rising berms. An undulating roof will mimic the rise of a formation called Point of Rocks located in the valley. The shape of the structure is meant to evoke the dimensions of a spacecraft, with the double-height hangar rising along the linear axis, administration offices to the west, and areas for preparation and viewing in the larger eastern flank. Passengers will enter the building through a deep channel cut into the ground, walking along retaining walls housing exhibitions by the region’s residents and about the history of space travel. Views of the main “superhangar” will also be revealed before passengers reach the terminal, building drama with glimpses of the spacecraft and simulation area. A similar technique will be used for the terminal, where the control room will be visible but not open to the public. The facility hopes for a LEED Platinum certification, with passive energy solutions, consolidating glazing to the eastern elevation to minimize heat gain, and using the building’s massive size to draw ventilation into cooling subterranean chambers. Photovoltaic panels will supplement power production. Acknowledging the element of spectacle certain to be associated with the structure’s novel use, while playing upon New Mexico’s rich space travel history, resulted in “flowing, dramatic spaces, and a form using natural materials that are essential, and awe-inspiring,” says Antoinette Nassopoulos, a partner at Foster + Partners. Viewing platforms are incorporated as large windows into the concrete shell, designed to best deliver the experience to both space-bound astronauts and the general public. “Visibility of mission control and take-off and landings from the spaceport add to the drama,” Nassopoulos added. Groundbreaking is set for next year. At last year’s Green Build Conference in Denver, the USGBC announced the Portfolio Program, a one-year pilot that commits large-scale corporations to adopting LEED building practices by bulk certifying comparable buildings. 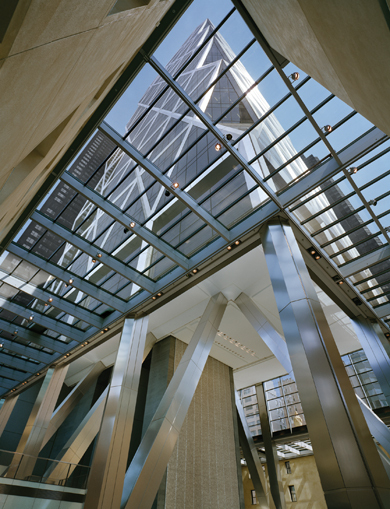 Participants commit 25 buildings, or two million square feet, for LEED certification; both new construction and retrofit projects are eligible. The corporations develop green prototypes for standardized use with USGBC incentives such as discounts on the LEED certifications, customized training, and educational resources. The program launched with commitments from the University of Florida, Starbucks, Toyota, the University of California, Santa Barbara, and HSBC. While the number of participants is limited in the first year of this program, which runs until the end of 2007, new LEED certified buildings are already debuting. 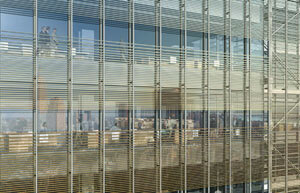 The London-based international banking giant HSBC has opened its first LEED Gold certified branch in Greece, New York. The building is carbon neutral thanks to geothermal heating and cooling, solar panels, and energy purchased from a wind farm. Rainwater captured from the roof is used for restroom operations and watering the landscape. Indoor lights dim in response to sunshine and the glowing sign uses LEDs. Rapidly renewable materials used on the interior include bamboo flooring and wheat and corn-based products. John Beckinghausen, VP and Director of Environmental Sustainability for HSBC North America, explains that with this prototype in place, the company will open 24 new LEED certified branches over the next four years. While some projects may take over existing buildings, all will be new branches as part of an expansion project. While green features of the Greece prototype will be repeated, the company is not establishing a standardized aesthetic for the designs, which will appear all around the country. A new 460,000-square-foot HSBC headquarters building in Chicago will also seek LEED certification; the five-story office tower is being designed by Wright Architects in Chicago. The facade is lit by Erco lighting system, with lights installed at various floor levels, giving the building the appearance of being lit from the ground up. This gradation system means that the 250- watt lights consume only 25 percent of the energy normally required for a building this size. 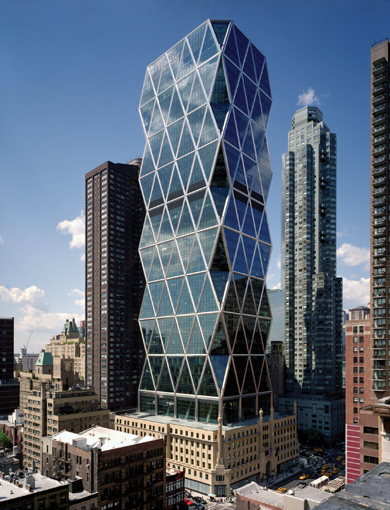 Renzo Piano's design makes transparency a signature theme of the building, and he decided on low-iron, floor-to-ceiling Star Fire glass windows as part of it. But that meant heavy glare and high heat transference. The problem was partially solved by running 170,000 aluminum silica rods (Piano calls them baguettess) 1.5 feet outside the windows, which reduces the amount of light entering the building and directs light deeper into the interior. The Times took things one step further by entering a partnership with Lawrence Berkeley National Laboratories, a leader in lighting studies, to evaluate and select a dynamic lighting and daylight harvesting system. Having already decided to build the Queens mock-up to study interior architecture possibilities, the project was easily expanded to include a lighting element. Over a 12-month period, the mock-up, which received grant money from both the states of California and New York as well as the Department of Energy, found that automated shadessthe bid for which was won by MechoShade and its AAC SolarTrac systemmcould significantly reduce glare and heat, and thus energy consumption. The philosophy is to maximize natural light coming in, maximize the connection to the outdoors, maximize the view, but not cross over into glare,, said Glenn Hughes, director of construction and real estate for the Times. 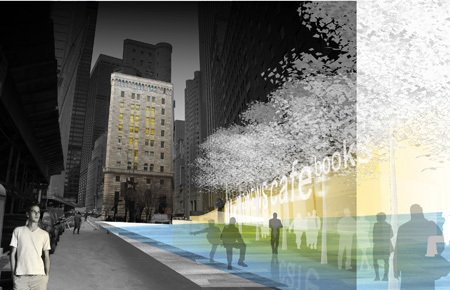 The shades are programmed to know the position of the sun at any time on any day, as well as the shadow footprints of surrounding buildings. Cloud cover is measured by radiometers on the building's mast. The system can run automatically but the Times insisted that employees be able to override the shade settings easily. If someone wants to bring in more light, they may bring the shades up or down,, said Jan Berman, president of MechoShade. 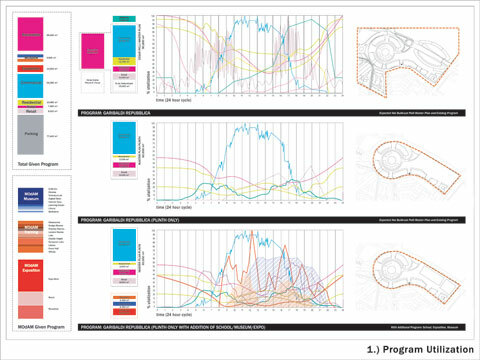 There are color touch screens, with a little footprint map that shows where the motors are.. Based on data culled from the mockup, the Times expects a 35-percent energy savings from the shading system alone. A stumbling block for the newspaper was the high cost of the dimmable ballasts, the devices that control the flow of electricity into the fluorescent lights. Because so few were in use at the time, the initial price per ballast was between $75 and $120. But by ordering a very large amount and arguing that the building would help revolutionize the market for such ballasts, the newspaper managed to bring the price down to between $30 and $755an achievement that may enable dimmable lighting to become a standard part of the American office environment. 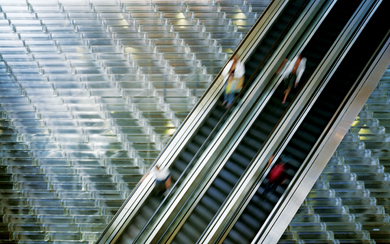 Virtually every office building in the United States is equipped with ceiling HVAC systems. But once again, the Times decided to be different and placed the air conditioning in the floorran idea borrowed from European office buildings, where natural ventilation is more commonly accepted. 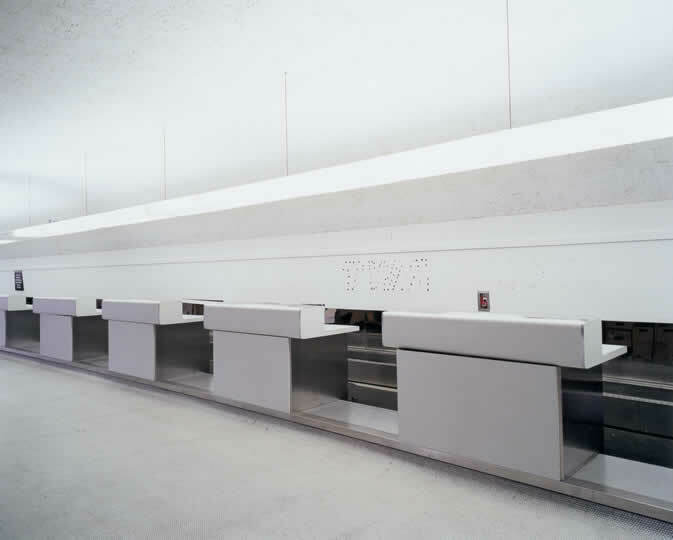 Having already gone with a plenum floor plan in order to better run computer cables, the project designers realized that they could achieve remarkable energy efficiencies by piping cold air through the floor (a system by Tate Access) as well. Hughes explained, The supply air is coming through diffusers in floor, and it picks up heat as it rises.. This is more efficient than dropping it from overhead ducts, which require lower temperatures in order to fully circulate the air. We're going to use 63 degrees Fahrenheit supply air; with an overhead duct, we would need 55 degrees. That means we're not using the chiller as much,, Hughes added. Moreover, because the system does not require ducts, it means that diffusers can be placed wherever needed, not just where there is a duct. The diffusers are then covered with a specially designed carpet piece which has miniscule holes in it for the air. When you look at the floor the [carpet pieces] look identical, but if you held one to a light source, you would see pinholes,, said Rocco Giannetti, senior associate for Gensler, the project's interior architect. Given the nature of a newsroom, the ability for the staff to circulate easily through the workspace is vital. The designers didn't have to go far for their inspiration: the New York loft. The idea was to create a modern loft of the 21st century, with big open plates and flexible space,, said Serge Drouin, an architect with Renzo Piano Building Workshop. It's a very New York fixture.. 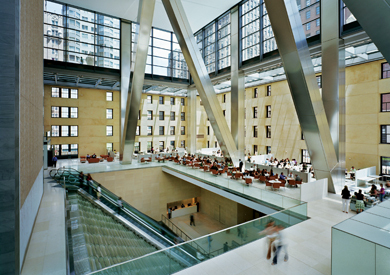 Thus in designing the building's interior spaces, 90 percent of the area was kept to an open plan, with the few permanently enclosed offices located toward the center of the building. 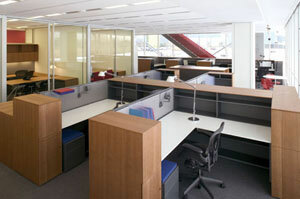 The rest of the space can either be filled with cubicles or floor-to-ceiling partitions. The building is on a 5-foot planning module grid, and we used that in developing an entirely flexible planning system,, said Giannetti. Light fixtures and other ceiling elements are organized in a system that allows partition placement at 30 inches..
Another innovative aspect of the open-plan scheme are two sets of stairs running on opposite sides of the building, just behind the curtain wall. That way employees can move between floors without having to use the elevator, enjoying stunning views of Midtown. Painted red, they are also highly visible from the outside, again highlighting the building's transparency theme. One obvious constraint, of course, was safety: Stairways running directly through the open floors could allow smoke to move easily from floor to floor in the event of a fire. We had to make sure that smoke would not spread,, said Drouin. In response, every other floor has fire shutters that close and contain smoke. If a fire breaks out, the shutters roll across the top of the stairs, closing them off. Because a national newspaper can't stop for things like power failures, the Times required that its new building come with a backup power system capable of running its vital newsroom functions. We need to have a certain amount of emergency generation to run the paper regardless of the electricity situation,, said Hussain Ali Khan, vice president for real estate development at the Times. That's about 15 percent of the total building load,, said Hughes. But the costs involved in maintaining such a system just for emergencies was beyond even the Newspaper of Record's budget. The solution? 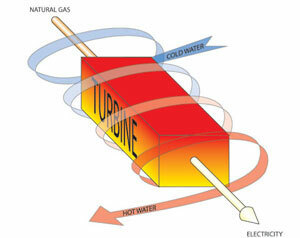 A co-generation plant, running continuously on natural gas and completely isolated from the city power grid. The plant's two engines generate 1.4 megawatts continually. We can provide enough power for data center operations: We can cool the data center and can run all of the newsroom, so people can continue to work regardless of ConEd's status or the New England grid,, Hughes said. The New York Times Company's headquarters fills the block between 40th and 41st streets, along 8th Avenue. In October 1999, the New York Times Company announced that it had entered negotiations with city and state officials to relocate its headquarters from West 43rd Street to a plot between 40th and 41st Street along 8th Avenue, across from the Port Authority Bus Terminal. 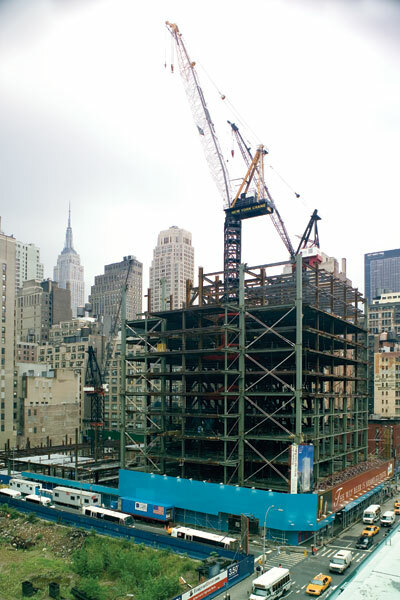 Almost six years later, that building is well under way, with steel up to the tenth floor of what will eventually be a 52-story, 1.67-million-square-foot tower. 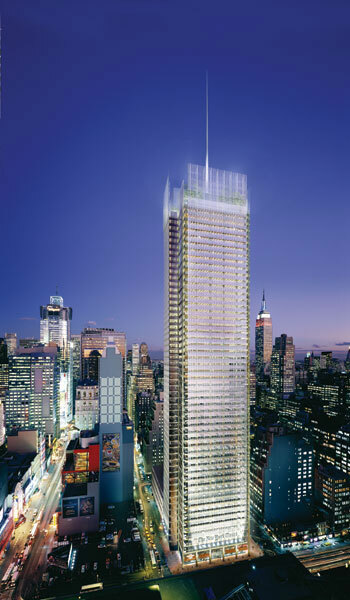 Along the way, the buildinggwhich is being developed in partnership with Forest City Ratner Companies (FCRC) and was designed by the Renzo Piano Building Workshop with Fox & Fowleehas faced more than its fair share of bad press. A high-profile lawsuit challenging the city's eminent domain powers to shutter the existing properties on the lot, followed by a poorly received application for Liberty Bonds by FCRC, have left the impression among many New Yorkers that the company was using its position as the city's newspaper of recordd to get sweetheart treatmenttan impression facilitated by the paper's many competitors, most notably the New York Post. But as real estate and city planning expertssas well as courtssattest, the history of the Times project is one of neither corruption nor favoritism. Rather, it is one of the more high-profile examples of powerful companies making use of the government's immense power to shape the urban landscape, a power often forgotten at a time when a developer seems to be running the show at Ground Zero and the mayor can't rally enough support to build a football stadium. But the story also shows how in New York, even the best-laid urban development plans can turn into a PR nightmare. In 1980, the Empire State Development Corporation (ESDC), a state-level public entity, created the 42nd Street Development Project, a 13-acre urban renewal zone along 42nd Street between Broadway and 8th Avenue. The parcel on which the Times building is now rising, though not on 42nd Street, was included in the zone because the ESDC initially saw it as a space for a massive merchandise mart, a plan that was never realized. There was a sense that the area was blighted in every way and was an underachieving aspect of the city,, said Robert Yaro, president of the Regional Plan Association (RPA). The Times parcel was one of last to come together.. The 42nd Street Development Project offered tax breaks to development within the zone and allowed the city to use eminent domain to facilitate new construction. In 1999, these breaks helped convince the Times to select the site for its new headquarters, having outgrown its current location on nearby West 43rd Street. In February 2000, the Times selected FCRC as its partner in developing the parcel. The building will be split as a condominium between the paper, which will own and operate floors 2 through 28 as well as an adjoining auditorium, with FCRC taking the top 24 floors, which it will lease as office space. The company has yet to find its first tenant. At the time, the partners said they planned to begin building by late 2000 and that Times staff would move in by 2004. That timeline was perhaps unrealistic; major negotiations did not end until early 2001. The same year, the company announced that Renzo Piano Building Workshop with Fox & Fowle had won an international competition to design the building. By then, the 42nd Street Development Project had proved a remarkable success, having turned a blighted district into a major entertainment zone, adding some 6.4 million square feet of theaters, shopping, restaurants, and hotels. But the district's transformation was a road paved with legal misfortunes; pre-project Times Square businesses held up the area's sanitizing developments in courts until 1990. The same fate befell the Times project soon after it was announced. The Times, FCRC, and the ESDC were sued by a developer, Gary Barnett, who owned a parking lot to be condemned on the site, accusing the trio of fraud, bad faith and collusion against the taxpayers of New York.. He argued that ESDC had low-balled the property's value and, thanks to the various benefits in the deallincluding an 85 percent rebate if acquisition costs rose above $85 millionnwas playing favorites. Other New York newspapers jumped on the news and the Times soon found itself in the middle of a PR crisis. But such criticism, experts say, was wildly misplaced. That's not a fair attack,, said Lynn Sagalyn, a real estate professor at the University of Pennsylvania who has written a history of Times Square's redevelopment. [The site] is and has been from day one a part of the larger 42 Street Development Project, which always intended and did use condemnatory powers. Eminent domain is a historical part of that project and everything was done through the correct legislative procedures.. Working against the Times was the fact that it had come late to the 42nd Street game. By 2000, the district was no longer a street of peep shows and drug dealers but a vibrant, family-friendly district of theaters and chain restaurants. This led many observers to question why the city was giving away such lucrative benefits in an area that was, in their eyes, no longer blighted. But according to Sagalyn, the area's relative health was irrelevant to ESDC's obligation to redevelop every plot within it. One could say, Let the market do it,' but that's not logical within the context of [the city's] public policy. Getting that site developed was the last piece of [the city's] larger public policy development,, she said. A series of court rulings concurred, finding that the agency's charge was to do what it thought was best in the long run for the zoneewhich meant, in this case, signing a generous deal to land a high-profile development. About the case, which was dismissed, Justice Martin Schoenfeld of the New York County Supreme Court wrote in April 2002, The urban renewal law authorizes the sale of property to an applicant which does not necessarily offer the highest price but proposes to develop the property in accordance with the purposes of the site's urban renewal program.. Meanwhile, the Times and FCRC found a new enemy in Steve Cuozzo, a real estate reporter for the New York Post who hounded the paper in more than a dozen columns between 2002 and 2004. Cuozzo accused The New York Times of shilling for a partnerr by publishing negative accounts of the downtown real estate market and positive accounts of FCRC's other projects. Catherine Mathis, a spokesperson for the Times, denied any wrongdoings and Cuozzo was never able to move his charges beyond conjecture. The partners took control of the site in September 2003, but the project was halted again when FCRC found itself unable to secure either a sizable loan or a major tenant. Claiming that the real estate market had deteriorated since the project began, the company had applied for $400 million in Liberty Bonds in July 2003. Congress had set aside $8 billion in Liberty Bonds, of which $2 billion could go outside Lower Manhattan. The Liberty Bond application once again drew public flak, even though other midtown companies were also applying for Liberty Bond loans and the program in general was undersubscribed. In fact, said Sagalyn, given the relative lack of interest, FCRC's application was actually a good thing. If you're not using the benefits the feds are giving, the feds will be quick to take them back,, she said. (When the authorizing legislation for Liberty Bonds expired in January, only half of the federally approved $8 billion had been allocated.) FCRC's application was nevertheless poorly received downtown, and in May 2004 it dropped the request, announcing a month later that it had secured a $320 million conventional loan from the newly created General Motors Acceptance Corp. (GMAC) Construction. Though the $800 million project is on track for 2007 completion, yet another wrinkle has arisen, this time involving FCRC's application for $170 million in tax breaks through a state program that encourages brownfield development. But a revision to that program passed earlier this year allows the state to deny funds to projects whose clean-up costs do not represent a significantt portion of the total cost, a change that, according to the Post, some say was designed specifically for the Times building. We have applied for the program,, said Michelle de Milly, a FCRC spokesperson. No decision has been made.. The building's PR woes seem never-ending. Just two weeks ago, the Village Voice ran the front-page story, Times' to Commoners: Go Elsewhere: Don't soil our publicly subsidized new HQ with your riff-raff,, which took issue with the building's extensive lease restrictions. A Times spokesperson responded by stating that the company and FCRC are seeking tenants that will complement our new building.. When the tower is completed, New York will have seen how to build a first-class building and how hard it is to get it built. CLAY RISEN IS AN ASSISTANT EDITOR AT THE NEW REPUBLIC AND IS A REGULAR CONTRIBUTOR OF AN.